Why Do Young People Have Food Issues? It’s interesting to note that until the 1940s in many parts of the West, children didn’t eat with their parents until they reached a certain age – anything from 14 – 18, in other words, their adulthood was marked by moving from eating with the other children to eating with the grown-ups. In modern families, where children eat with their parents from the age of three or so, and probably never sit down to dinner as a family after the age of about ten, we have no way of marking a child’s move into adulthood through food rituals. Perhaps it’s not surprising that teenagers invent their own by refusing family food and eating junk. More worryingly, this is an age when some teenagers will develop ingrained eating disorders. 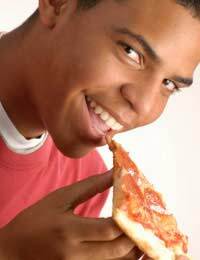 Being picky or faddy and worrying about weight or appearance are normal in adolescence and 40% of boys and over 70% of girls will go through episodes of ‘difficult eating’. For a very few young people this can become pathological and result in anorexia or bulimia. The first thing is to realise that eating disorders are psychiatric in origin, not physical, and to get help from professionals if you fear your child, or a friend, is developing unusual behaviours around food. You can talk to a doctor, a teacher, a nutritionist, or a counsellor, but don’t go it alone, trying to tackle these issues without support can be difficult and painful. The second thing is to recognise that many people have problems with food, and cope perfectly well with life, succeeding in having careers and families – an eating disorder is not necessarily dangerous to health, and treating people with an eating disorder as if they are ill can be counterproductive. The best way to prevent eating disorders is to give adolescents a strong sense of themselves as being normal, healthy and likeable, whatever their shape or size, and to give them a degree of control over household eating. Let them pick the menu one day a week, and if they like to cook, get them to help in the kitchen, even if their menus aren’t particularly well-balanced nutritionally. You can always correct dietary imbalances over the next few days and feeling they are empowered to choose, cook and serve food is a great way to get teenagers to take an interest in their diet. Many teenagers, but particularly boys, will go through a phase of eating nothing but junk food and this can be very distressing to parents who have tried to ensure a good family diet. One reason for this behaviour is peer pressure, and another can be growth spurts. Some boys grow in short spurts that place intense demands on the body and they literally cannot get enough calories to fuel their increasing height and bone density. Foods high in sugars and fats give empty calories fast, and this can relieve their constant hunger, although it doesn’t do much to build strong bodies. You can help relieve the junk food years by ensuring your child eats a good wholegrain cereal with skimmed milk or yoghurt each morning, or wholegrain toast with low-salt peanut butter, which gives a good food balance at the start of the day. Many young people leave home in their teenage years to go to college or university, or to travel in their gap year. This can cause parents to worry about their eating. Student grants are not generous and there are always stories about students not eating, or living on rice and cornflakes, when the money runs out. A proportion of students are quite clueless when it comes to buying, preparing and cooking food. Make sure your child isn’t one of them by teaching them to cook three or four simple budget dishes such as spaghetti with tomato sauce, cottage pie, omelette and a salad and you can feel sure that they won’t starve. A food pyramid can help them understand how to balance their food over a day, even if they don’t always manage it. Give a child leaving home for digs or a few months travel, a small paperback recipe book designed for students so that they can try out cooking on their own.